Spray a griddle with nonstick olive oil spray, heat to medium heat. In a large bowl, whisk together pancake mix and water until well combined. Fold in rainbow chips, leaving 1 tablespoon out for garnishing. Cook batter on a griddle heated to medium heat until golden brown on one side, flip and cook on the second side until cooked through. 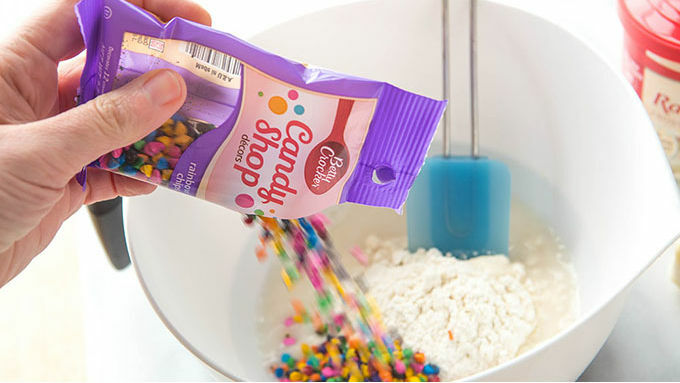 In a small bowl, stir together Rainbow Chip frosting and softened butter. 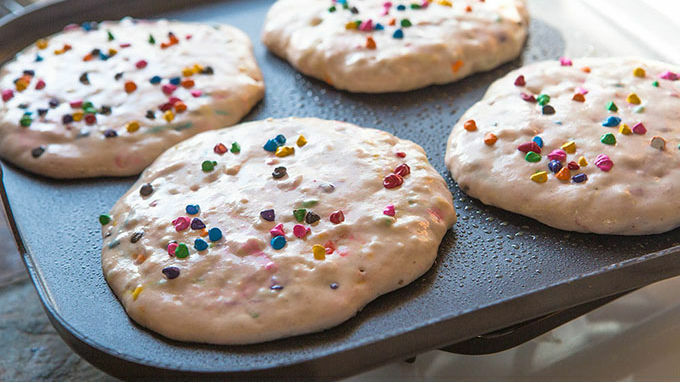 Spread on top of warm pancakes. 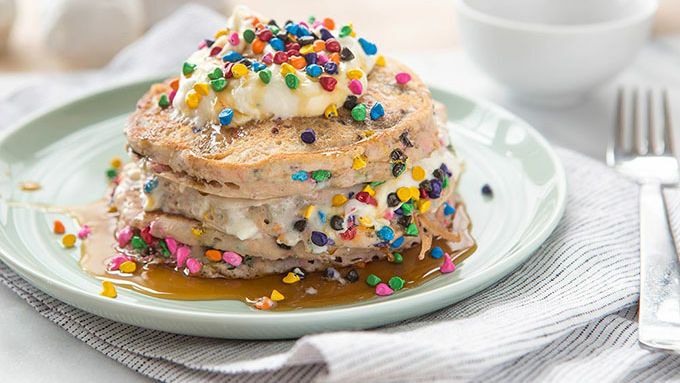 Drizzle with maple syrup, garnish with remaining rainbow chips and enjoy! Though I'm a grown-up woman with four little tots to call my own, I still can’t help but feel like a kid again when I see a bowl full of rainbow chips. Last week I bought a bag of these colorful candy-coated chocolate chips and tucked them into my cupboard. I found myself sneaking into the kitchen hours later so I could toss handfuls of rainbow chips into my mouth. It was midnight. I am not proud. If you’re as big a fan of pretty little rainbow chips as I am, you should know we’re not limited to midnight bouts of chip-sneaking. No way. Rainbow chips deserve to sit at the center of your table for breakfast, too. I know you agree! And so, I made us a recipe. Now listen to me carefully: Mix the batter first. THEN fold in the rainbow chippies. If you try to shortcut and stir it all together from the get-go, you’ll have a mushy brown looking mound of batter. Now, with pancakes prepped, slather that butta on top of your pancakes. Or, if you’re like me, just ice-cream-scoop a heap of the stuff on top. A quick drizzle of pure maple syrup. And one more sprinkle of rainbow chips… And this plate of pancakes is ready for loving. And hugging. And tossing. Except without the tossing part. And probably without the hugging part. Just grab a fork and enjoy. You deserve it.